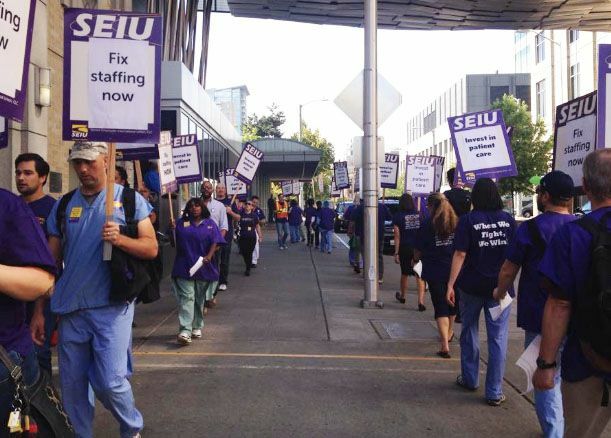 Harborview Medical Center is in the midst of contract negotiations with staff, and nurses are worried that patients might get lost in the shuffle. Since October 31st, roughly 1,900 nurses and other healthcare workers have been operating without a contract. Salaries aren’t the most contentious topic in negotiations; workers are most concerned with staffing, stating that overworked staff members are putting patients at risk by trying to do too much with too little time. When nurses take a break, they can’t leave their patients unattended. They hand their patient load off to another nurse, who then has to handle twice his or her usual patient load until the person responsible for those patients returns. During the night shift, when there are already fewer nurses on duty, one nurse might be left alone caring for up to 10 patients. When too many nurses need to take their breaks, patients might end up waiting more than 20 minutes for crucial services like pain medication or cleanup after a late-night accident. “People have had to lay in their feces with their wounds exposed,” said Joseph Hufford, a Harborview night-shift nurse. Some nurses deal with the problem by not taking any breaks at all. Over the course of a 12-hour shift, the fatigue of constantly caring for patients can catch up with those nurses, who are at higher risk of dispensing the wrong medication or failing to notice a crucial symptom. Although California state law mandates safe staffing ratios for hospitals, Washington State has no such law on its books. Two national safe patient ratio bills are in the works, but meaningful reform has been slow. The National Nursing Shortage Reform and Patient Advocacy Act | S. 864 (Boxer), a bill that would require acute-care faculties to maintain a certain ratio of nursing staff to patients, is currently in the Senate; Safe Nurse Staffing for Patient Safety and Quality Care Act - HR 1602 (Schakowsky), targeting nurse staffing ratios in all hospitals, is currently in the House. Until then, hospitals have control of how many staff members to keep on duty, even if that number is dangerously low. If you or a loved one has been hurt by a medical mistake or medical negligence, it may be time to speak with an experienced medical malpractice attorney in Seattle about whether you have a case for medical malpractice.